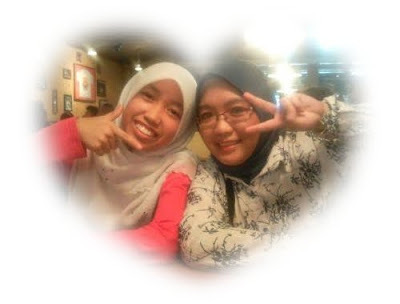 My 20-year old sister is leaving for Japan tomorrow to further her study. We are all feeling sad but trying not to show it. God knows what is going on in Mom's heart right now. Fear probably? After all, the news just reported another earthquake in Tokyo. Will she be in God's protection throughout her study period there? Insya Allah. As for me, I'm feeling kinda weepy right now. I don't know how long will we meet her again after this. Entah2 Khayla dah pandai berlari, bercakap and may even know how to read by the time she gets to meet her Usu Farah again. As a child, Dekyah was never an attention-grabber (unlike Khayla). She was the go-with-the-flow type of little girl. Sometimes we forgot her opinions and feelings and treated her like a wall flower. My elder sister and I were guilty of imposing our minds on her throughout her childhood. Yet here she is, surpassing all our expectations and growing out of her baby sister image. Actually she already proved everybody wrong when she insisted to go to boarding school at the tender age of 12 years old. At 16, I was still very much attached to home and quit boarding school after only 2 months. Yet there she was, all scaredy-cat, but determined to overcome her fear and chart her own future. I was so so proud of her back then. I knew that she will shine brighter than any of us had ever done. Please thank us for making you that strong and independent girl, ye adik. Somehow, being away from home and being on her own (and surrounded by people who are more sane and treat her better than us), has managed to bring out her true personality. My Dekyah is a very nice, down-to-earth, hardworking and humorous girl deep inside. Unlike our elder sister (fiery) and myself (moody and dramatic), Dekyah is very much cool-headed. She hardly jumps at any sudden issues she faced along the way. I might be screaming bloody murder at anyone who tries to mess up with my life and routine, but she will most probably calmly step aside and continue her way. It is as if nothing ever bothers her. To me, that is something very admirable. But that does not mean she's robotic and doesn't have emotions. She does, but she just displays the good ones. Me? I am like an unstable nuclear rod. Oops. Bad example. She WILL blend in well with the Japanese people. That I'm SURE. While you are here, I enjoyed your company tremendously. We jumped into the swimming pool and laughed together. I tried to teach you how to swim or at least, float. And laughed at your feeble attempts. We shared the same liking for a certain fashion, and if we had a bit more time I'm sure we'll have fun window-shopping kan? We even shared our fun teasing Mom (kesian Mak pulak kena buli!) and yes, I found the story of you cheerfully waving at KLCC while Mom frantically tried to find a U-turn yesterday, highly amusing it tickles my heartstrings! Also, isn't it fun making up outrageous scenarios out of a short incident a.k.a. merapu2? All this while, Mom and I were the only two participants in merapu2-ing (making up ridiculous story line from an innocent remark), but recently you had joined the club as well. Then we rolled in laughter over breakfast / lunch / dinner (elok la tu, ketawa berguling-guling depan makanan...). When you are there, please don't forget us in your busy-ness. Let's Skype once or twice a month. Continue writing your blog too because I will look forward to reading about your student life in Japan. I find your writing very cute and very much Japanese anime! And most importantly, never lose your way. Keep your prayers, and God will keep you safe. Call Mak once a month or more, if you can. Lastly, please forgive us, your siblings, for bullying you all this while. Thank you for not taking it to heart and instead, taking it in your stride and becoming a better person! You must know that as your sister, I feel very very proud and at the same time very very protective of you, so I shall always worry about your safety over there. But. I know you are strong, so keep your tears. Let's not cry tomorrow ye. I wish you all the best at the Land of The Rising Sun, and enjoy your experience as a foreign student! Sigh. I miss my sister already! Amy: Yalah, kamek org semua doakan nya selamat siya. Nya ada juak call 2 kali, seems everything ok jak and happy :) Nya dah beli basikal pun siya. Hehe. Adik ko bila fly US?